The PCIe 6 pin to 8 pin power adapter eliminates the expense of upgrading a computer power supply for the sake of compatibility with a newer video card. Notes:Please allow 1-2cm error due to manual measurement. High quality 6 pin to 2 x PCIe 8 (6+2) pin graphics card PCI-e Express VGA splitter power extension cable. Provides an option for connecting a power supply without an 8 pin PCIe connection for GPU power. Eliminates the expense of upgrading a computer power supply for the sake of compatibility with dual video card systems.ense of upgrading a computer power supply for the sake of compatibility with dual video card systems. 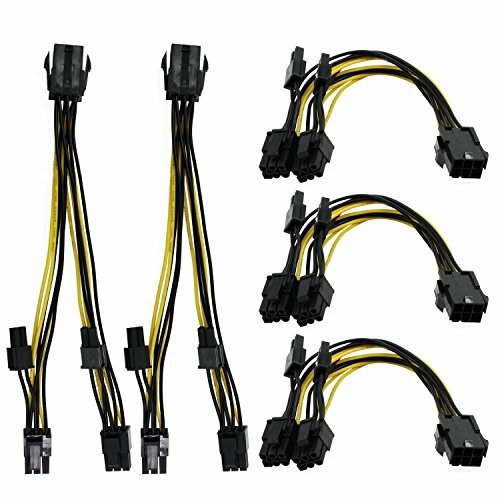 8 PIN PCIe to 6 PIN male to female adapter cable provides a convenient solution for supplying video graphics card power with an 8 pin connector for GPU cards that require more power. Convenient solution for adding two extra PCI Express connectors to your existing power supply.